Treasures galore. Just priceless. Yours for the getting. Those are the offerings at the Priceless Silent Auction fund raiser for Main Street Guymon that takes place at Draper’s Headquarters on Sat., Apr. 7. From 5 to 7 that evening you can bid on antiques to priceless opportunities like the “Fireman for an Hour” donations. The bidding actually goes until 6:30 pm and are then announced and settled. While you’re waiting for the auction to end, you can partake of the delicious soup bar for supper and look around at the wonderful collection gathered by Jim Draper. It does cost $10 at the door to come in and be a part of the auction. Hal Clark is cleaning out old furniture from his ranch in Cimarron County and there are items of furniture and more from Clark. Even an early 1900 set of golf clubs is included, a steamer truck, picnic hamper, and an old stereo are a part of his collection. Several chairs date from the late 1800s. Then there is a graduation cake decorated by Brooke Tuttle, Fireman for an Hour by the Guymon Fire Department, batting lessons by OPSU Assistant Baseball Coach Keith Schulz, handmade wooden toys by Mel Grantham, Texas Hold ‘Em instruction for up to four people by Paul Montgomery, a pan of homemade chili rellanos by Norma Green, and more. Mel’s Creations will make a memory bear from a piece of clothing that was worn by someone you love for a Memory Bear. 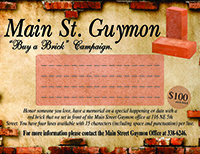 All auction items are donated so the funds raised can help continue the many Main Street Guymon community programs. Be sure to look on facebook at the items. If you are interested in donating or for more information, please contact Melyn Johnson at Director@MainStreetGuymon.com or call 806-681-9881.